It's not a stretch to say audiences have missed their favorite family of Supers over the past 14 years. Disney/Pixar's Incredibles 2, the sequel to 2004's beloved Oscar®-winning The Incredibles, received a mega-strong reaction from critics and audiences - earning a 93 percent critics rating on Rotten Tomatoes, rocketing atop the list of highest-grossing animated films, and surpassing $1 billion at the global box office. Fans can reunite with this incredible family of Supers instantly on Digital in HD and 4K Ultra HD™ and on Movies Anywhere on Oct. 23, and on Blu-ray 4K Ultra HD,™ Blu-ray,™ DVD and On-Demand on Nov. 6. Family members of all ages will be hypnotized by hours of delightful entertainment, with never-before-seen Incredibles 2 bonus material highlighting the beloved characters in the film and the filmmakers who bring them to life. When audiences instantly bring home the film two weeks early on Digital, they will receive additional exclusive featurettes, including two SuperScene Breakdowns and Samuel L. Jackson discussing his character Frozone a.k.a. "The Coolest Guy in Show Business." Overall bonus includes an all-new mini-movie "Auntie Edna," which gives a glimpse of fashion visionary Edna Mode's all-night endeavor to design a suit to best harness baby Jack-Jack's expanding super powers. Also included are an inside look at the impressive production team at Pixar Animation Studios; documentaries highlighting the film's relatable characters and stand-out scenes; 10 never-before-revealed scenes; filmmaker commentary; the touching theatrical short "Bao" and a corresponding featurette about how the dumplings sprung to life; and much, much more. Incredibles 2 is packaged and released in several different ways, offering families the flexibility to watch the movie instantly and on a variety of devices of their choosing, including Digital 4K Ultra HD, HD and SD and physically as a 4K Ultra HD Combo Pack (4K Ultra HD, Blu-ray and Digital Copy), a Multi-Screen Edition (Blu-ray, DVD and Digital Copy) and a single DVD. Additionally, the Digital HD/SD, Blu-ray and DVD versions of the film have been modified in an effort to accommodate photosensitive viewers, however individual sensitivities may vary. 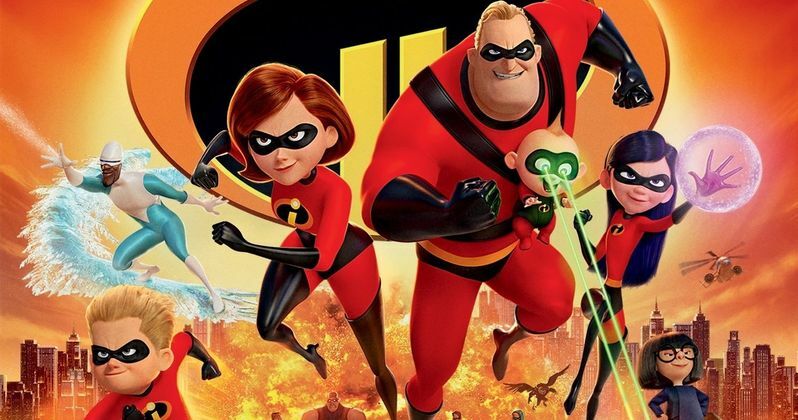 In Incredibles 2, Helen (voice of Holly Hunter) is called on to lead a campaign to bring Supers back, while Bob (voice of Craig T. Nelson) navigates the day-to-day heroics of "normal" life at home with Violet (voice of Sarah Vowell), Dash (voice of Huck Milner) and baby Jack-Jack-whose super powers are about to be discovered. Their mission is derailed, however, when a new villain emerges with a brilliant and dangerous plot that threatens everything. But the Parrs don't shy away from a challenge, especially with Frozone (voice of Samuel L. Jackson) by their side. That's what makes this family so Incredible. • The Coolest Guy in Show Business - In this partially illustrated documentary, Samuel L. Jackson reflects how his childhood and love of comics shaped his passion for film and imaginative storytelling. • 2 SuperScene Breakdowns - Casual commentary-style pieces looking at specific scenes in the film (The Racoon Fight and Mrs. Incredible) through a particular creative focus like action choreography, set design or story. • All-New "Auntie Edna" Mini-Movie - When Bob Parr visits super-suit designer Edna Mode looking for help with his high-energy toddler Jack-Jack, Edna pulls an all-nighter designing a suit to harness the baby's seemingly limitless powers. • 10 Deleted Scenes With Introductions - Suburban Escape, Kari Revisited, Return of the Supers, Chewed Out, Late Audition, Slow Day, Frozone and Honey, Restaurant Robbery, Fashion Show and Security Breakdown. • Super Stuff - From buildings and vehicles to costumes and props, every action movie requires a lot of really cool stuff. Meet the makers and learn what it takes to design and build such a uniquely incredible world. • Heroes & Villains - A collection of mini-docs about the backstory and major design ideas behind the Incredibles 2 characters - featuring voice actors, director Brad Bird, and Pixar artists talking about the many elements that make these characters feel real. • Ralph Eggleston: Production Designer - This short piece explores the many ways a single production designer has influenced the look, feel and character of the Pixar universe, culminating in Incredibles 2. • Strong Coffee: A Lesson in Animation with Brad Bird - Brad Bird's passion for animation dates back to his childhood and mentorship under Disney's Milt Kahl, and that enthusiasm and powerful insight emanates from every film he's made. Take a deep dive into Brad's early years at Disney Animation Studios and his time at Pixar. • Paths to Pixar: Everyday Heroes - At its heart, Incredibles 2 is about family dynamics and the challenges of being a working parent. Meet the parents of Pixar as they discuss their personal connections to the film and their experience with stretching to balance work and family. • SuperBaby - A documentary/hip hop music video hybrid hosted by Frankie and Paige from Disney Channel's Bizaardvark. This piece explores how Jack-Jack came to life onscreen - from design to special effects to animation - all set to a hot beat. Commentary - Get inside commentary from animators Alan Barillaro (supervising animator), Tony Fucile (supervising animator, story artist and character designer), Dave Mullins (supervising animator) and Bret Parker (animation second unit and crowds supervisor). • Theatrical Short: "Bao" - An aging Chinese mom suffering from empty nest syndrome gets another chance at motherhood when one of her dumplings springs to life as a lively, giggly dumpling boy. Making "Bao" - Director Domee Shi shares her secret recipe for making an animated short - discussing how her rich cultural heritage, unique relationship with her mom, and her love of food all informed the making of the food-fantasy "Bao." • Outtakes & Stories - Raccoon Fight Story, Evelyn Animation Outtakes, Puppet Animator Interview, Outtakes Goofy Arms Story and SuperBaby Music Video. Holly Hunter and Craig T. Nelson return as the voices of Helen and Bob Parr, who still struggle to juggle their duties as parents and Supers. Sarah Vowell once again provides the voice of the teen-queen of sarcasm Violet, while Huck Milner joins the cast as the voice of 10-year-old Dash, and Samuel L. Jackson reprises his role as the voice of Lucius Best - aka Frozone. Incredibles 2 also features the voices of Brad Bird as fashion visionary Edna "E" Mode, Bob Odenkirk as savvy businessman and Super fan Winston Deavor, Catherine Keener as tech pro Evelyn Deavor, Jonathan Banks as Rick Dicker, Sophia Bush as up-and-coming hero Voyd, and Isabella Rossellini as an influential ambassador and advocate for Supers. Written and directed by Brad Bird (The Iron Giant, The Incredibles, Ratatouille) and produced by John Walker (The Incredibles, Tomorrowland) and Nicole Paradis Grindle (Sanjay's Super Team short, Toy Story 3 associate producer), Incredibles 2 is executive produced by John Lasseter. The Incredibles was the film that introduced Oscar®-winning composer Michael Giacchino (Up, Tomorrowland) to moviegoers, and he returns to the Incredibles universe to create the score for Incredibles 2.